Sumatra sits in western Indonesia and makes up part of the Sunda Islands. Consisting of a number of different provinces, Sumatra is often less-visited by tourists compared with some of the big hits in Indonesia such as Bali or Lombok. This is a shame, as Sumatra offers a completely different side of this vast and amazing country and is covered in gorgeous primary rainforest which Sumatran tigers, elephants, and orangutan still call home. One of the big draws in Sumatra is the diversity of experiences it offers visitors, and you can spend time in big cities like Medan or Banda Aceh, relax on soft sandy beaches or go trekking inside some of the most famous national parks in Indonesia. When it comes to unique culture, Sumatra doesn’t disappoint, and you can travel to Lake Toba to learn about the Batak way of life, or visit Padang which is the home of the Minangkabau people who run a matriarchal society. Wherever you choose to travel to in Sumatra, you will find welcoming spots that are off the usual tourist trails and that allow you to immerse yourself in traditional Indonesian life and culture. Medan is the third largest city in Indonesia and is also the capital of the province of North Sumatra. Unfortunately Medan is often used strictly as an entry and exit point for visitors who want to move on to other spots in Sumatra, but to miss a visit to Medan is to miss a trick. This vast city is known to domestic tourists as the culinary capital of Indonesia and you can happily spend a day eating local delights like Soto Medan and delicious Nasi Padang. 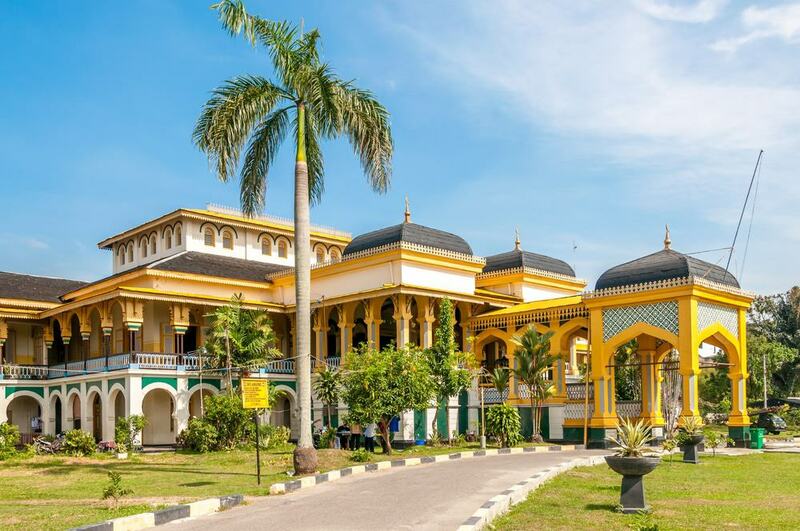 You will also find some impressive cultural attractions here such as Istana Maimun which is the home of the Sultan and you can learn the history of the royal family here and even dress up in period garb and take photographs in the ornate throne room. Other sites include the stunning Tjong A Fie Mansion and the main spectacular mosque called Mesjid Raya. Lake Toba is undoubtedly the main attraction in Sumatra and is around 5 hours away by road from Medan. The lake has the claim to fame of being the largest crater lake of its kind in the world and is said to be the result of a massive volcanic eruption or, as local legend has it, the result of the wish of a magic fish. Whatever the true story, the lake that sits in the crater of a long extinct volcano is one of the top sights across Indonesia and you can take a boat out on the water or go for a cooling swim. On the main island of Samosir you can visit a cultural village to learn about traditional handicrafts like weaving and see some spectacular old fashioned Batak houses made of wood. 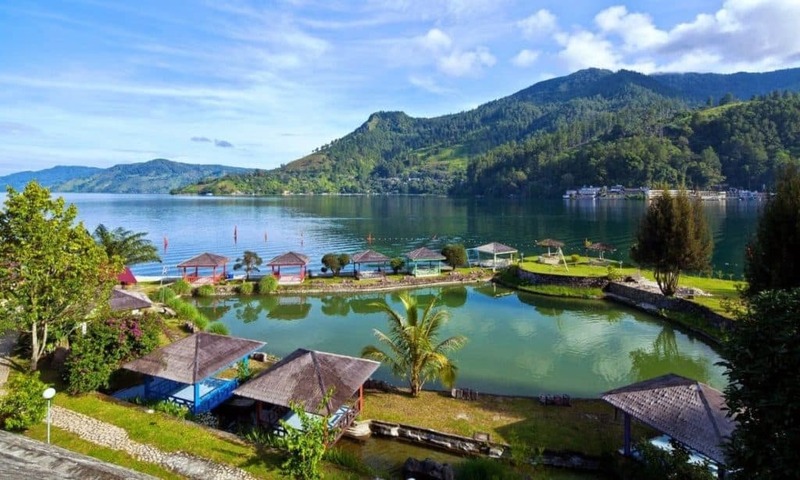 You can easily explore the Lake Toba region by car or motorbike and if you travel up into the mountains you will find hot springs and dainty villages dotted around the scenic countryside. Bukit Lawang is another one of the main attractions in Sumatra and is a small village that sits on the outskirts of the Gunung Leuser National Park. This protected area of jungle stretches all the way from Sumatra up into Aceh Province and is the home of a plethora of local flora and fauna. The main reason why many people come here is to see the local orangutans that live here and you can travel to their feeding platform twice a day to see them swing through the trees in search of bananas. Trekking is a common pastime here and you can choose from day hikes or longer treks that mean that you can set up camp in the middle of the rainforest. If you don’t fancy the downhill trek back into Bukit Lawang then you can opt for tubing down the river that runs through the jungle. The city of Padang in West Sumatra is rarely visited by international tourists although it is a well loved spot on the domestic tourism scene. The reason why many Indonesians flock here is for the food, as this is the birthplace of Nasi Padang, arguably the most famous regional cuisine in Indonesia. Nasi Padang consists of rice served with a range of curries and side dishes and there is no better place to sample it that the spot where it was first created. If you want to travel onward to the Mentawai Islands to go surfing, then you will need to stay overnight in Padang, and it is well worth spending a day or two here eating your way around the city before moving on. Gunung Sibayak is one of several volcanoes in Sumatra although it is classified as dormant and is one of the easiest volcanoes to climb if you are in the area. 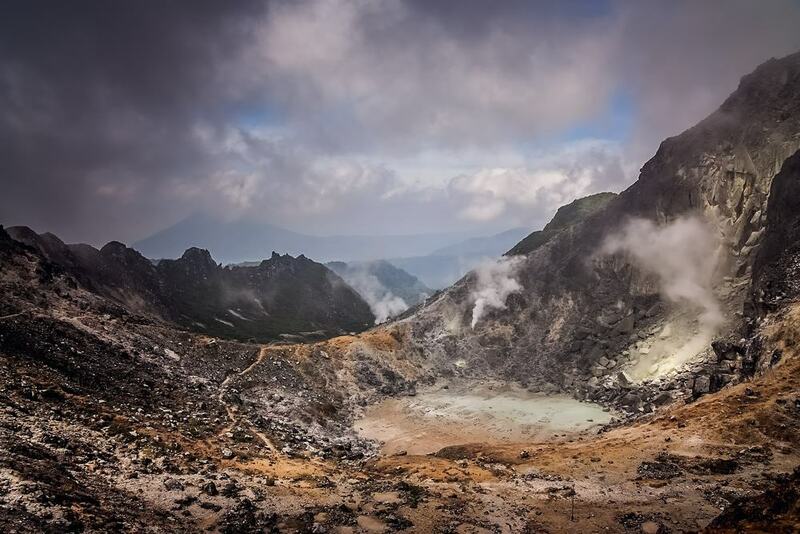 Located close to the town of Berastagi, Gunung Sibayak still has gas and smoke erupting from the crater from time to time and you will also find some soothing hot springs on the side of the volcano that are said to have medicinal properties thanks to the volcanic minerals found within. The hike to the top of Gunung Sibayak is around 7 kilometers long so depending on your fitness levels it should take around three hours to get to the summit. A guide is recommended especially if you are not an experienced trekker although this is not mandatory. The Mentawai Islands are made up of more than 70 little islands off the coast of Padang in West Sumatra and if you like surfing then this is a spot that it is not to be left off the itinerary. The Mentawai Islands are said to have some of the best surfing conditions in Indonesia and those in the know often travel to Bali first before moving on to the Mentawais for the rest of the surf season. Other activities on the Mentawai Islands include swimming, water sports, and trekking as many of the islands are covered in untouched areas of rainforest. Banda Aceh is the capital of Aceh Province and is unfortunately best known for the horrific tsunami that hit here in 2004. Much of the city has now been repaired however and you can visit places such as the Tsunami Museum to learn more about the tragedy. 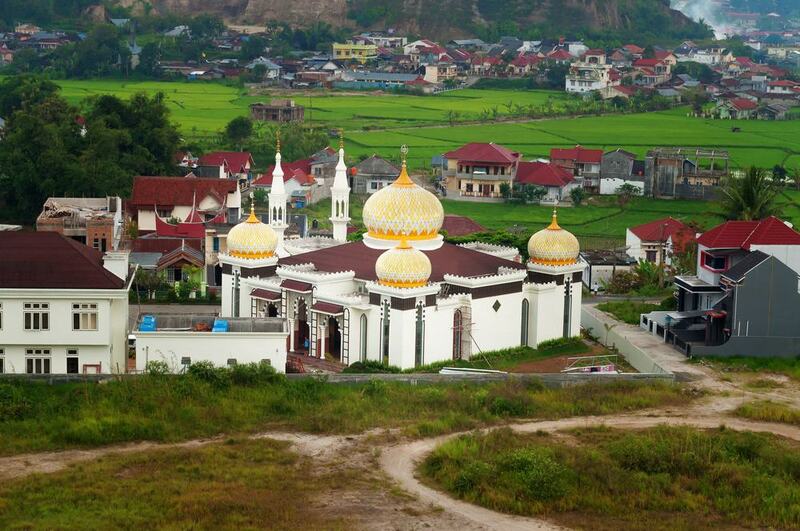 Other highlights of Aceh include its Grand Mosque which is one of the most beautiful religious monuments in Indonesia, as well as other haunting relics from the time of the tsunami like a large ship that was washed ashore and which has now become a permanent museum. Aceh is also famous across the country for its coffee so make sure to stop off at its most famous coffee shop called Warung Kopi Solong to try a cup. Bukittinggi lies in the west of Sumatra and the main reason to come here is to take in the surrounding scenery which is simply stunning. The premium attraction here is Lake Maninjau that shimmers with deep emerald waters and is encircled by lush countryside. 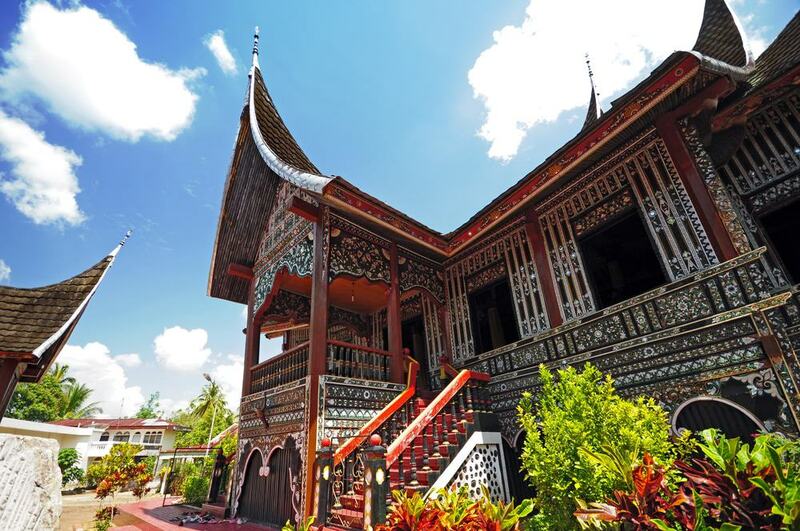 As well as the vistas over the water, this is also the land of the Minangkabau people and you can check out the wonderful Minang architecture here as many of the homes are shaped to reflect the horns of a buffalo. 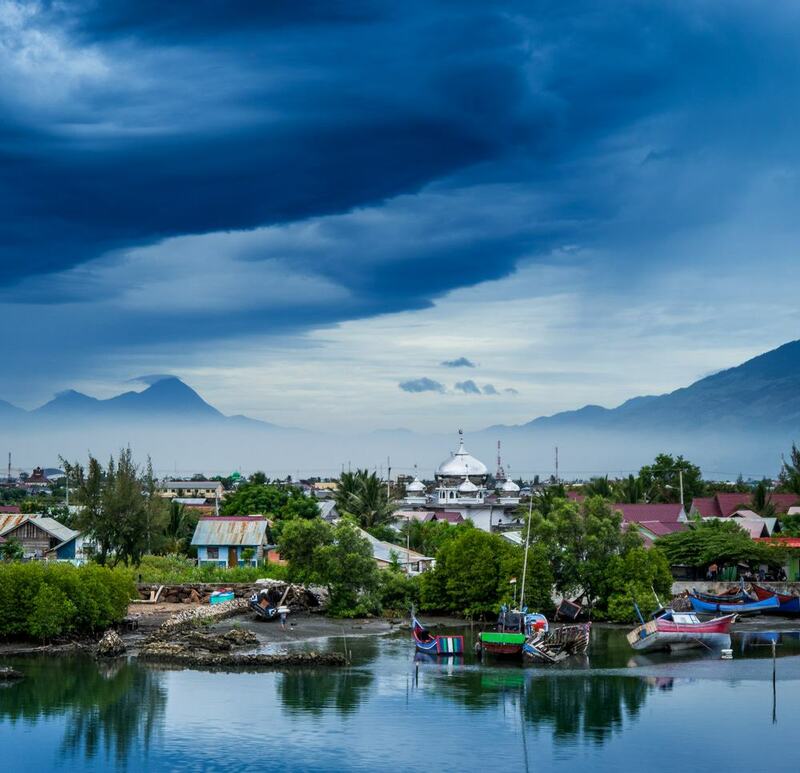 If you are travelling up into Aceh Province then it makes sense to also hop across to Weh Island which lies just off the coast. Something of a well kept secret in Sumatra, Weh Island offers you miles of beautiful sands and some of the clearest waters in the region, so if you like diving or snorkeling then this is a good choice. 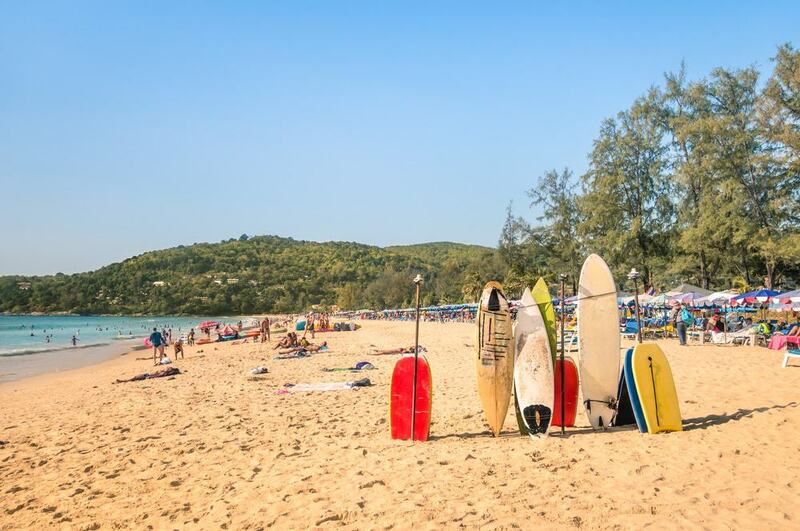 You will find a good range of guesthouses here as well as some beachside cafes that are the perfect spot to watch the sunset and you can also easily hire surfing or diving equipment here. 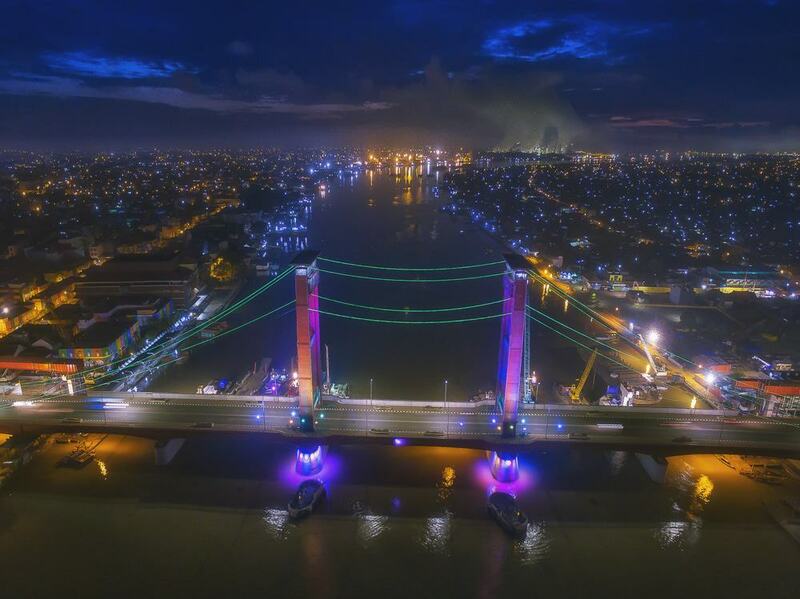 Palembang is the capital city of the province of South Sumatra and also has a fascinating history as is it one of the oldest inhabited parts of Indonesia. In ancient times it would have been the strategic center of the mighty Srivijaya Kingdom and occupies a pretty spot on the majestic Musi River. This river is actually one of the main reasons to visit Palembang as the waterfront is dotted with small boats that also serve as restaurants. On these boats you will find delicious plates of local delicacies that also allow you to take in the vistas over the water as you dine. 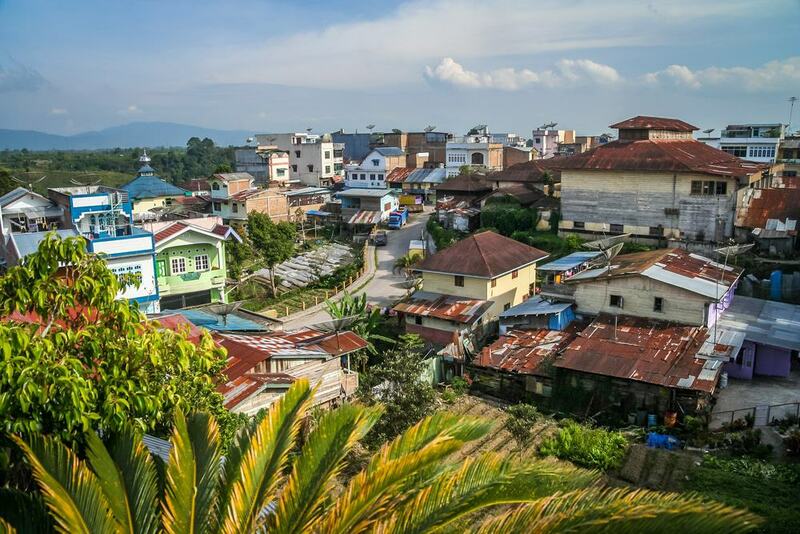 The town of Berastagi is only a few hours away from Medan but sits at a higher elevation which means that it has a very different feel to it. Many of the fruit and vegetables that make their way to Medan are grown in Berastagi and one of the highlights of a trip here is to visit one of the fruit farms and pick your own fruit straight from the trees. This is also the home of the Karo people and you can learn about the local culture as well as check out the amazing Karo architecture. Unfortunately Bali has come to dominate the surf scene in Indonesia, although if you are in Sumatra and are looking for some waves then look no further than the island of Nias. Here you will find a less crowded version of Bali and you can easily rent surf or diving equipment and explore the seas around the island. The area is also famous for its stone jumping tradition where locals have to clear a high stone in a single jump, so make sure to check out this amazing feat of athleticism if you are in the area. Batusangkar means ‘stone cage’ in Indonesian and is known on the domestic market as one of the most culturally important places in Sumatra. Located in the Tanah Datar Regency in the west of Sumatra, Batusangkar has a range of historical attractions such as Fort van der Capellen which was a Dutch outpost during the colonial period. Batusangkar is also famous of its traditional festivals such as pacu jawi which is basically cow racing that takes place in the muddy fields around the city. Jockeys hold on to a set of reins attached to the cow and then skate through the fields on the surface of the mud making this an amazing experience that is not to be missed if you are here at the right time. The schedule changes from year to year so it is best to ask locally when the next tournament will take place. 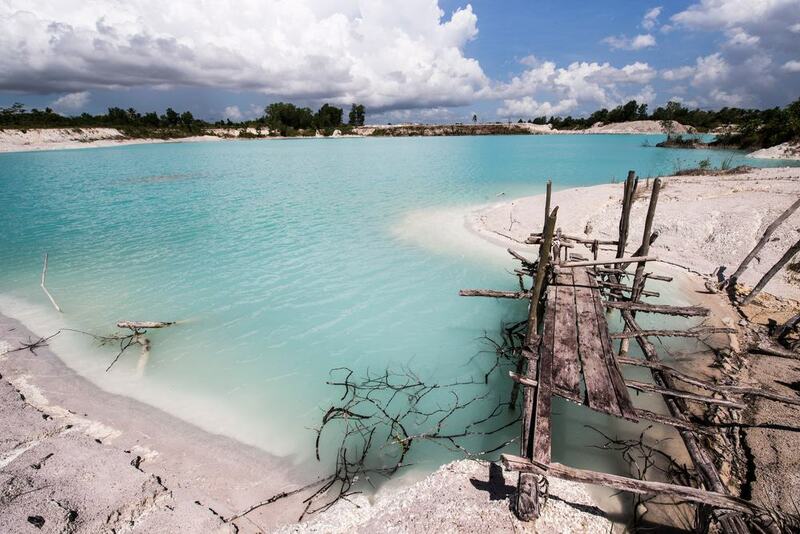 Belitung is an island off the east coast of Sumatra that sits in the Java Sea and is part of the wider Bangka-Belitung Islands. One of the main attractions here is the chance to explore the coves and islets and some of the main beaches that are not to be missed are Tanjung Tinggi Beach and Tanjung Kelayang Beach. 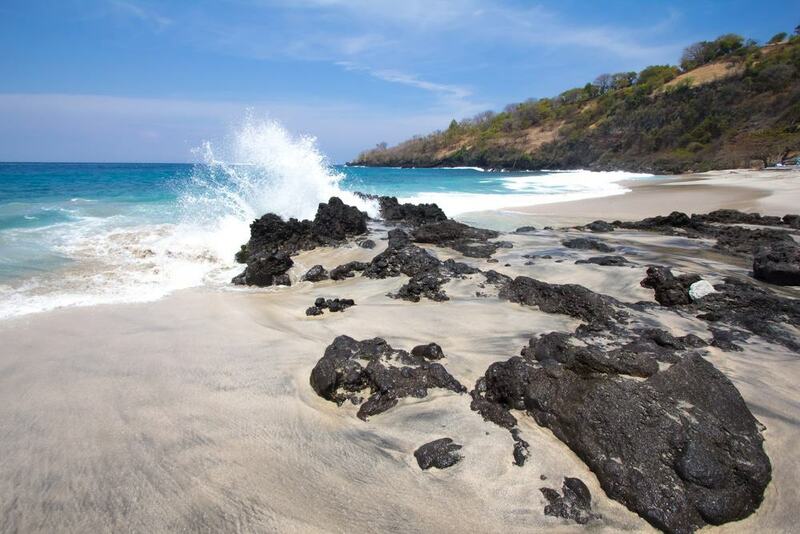 On a visit here you can expect cobalt blue seas as well as sandy beaches and a range of craggy granite rock formations that tower out of the water. Some of the main activities here include snorkeling and swimming or you can take a scenic boat trip. Lampung Province is hardly ever visited by foreigners to Sumatra and as a result is one of the best hidden gems in the region. You can travel to Pasir Putih Beach which means White Sands Beach in Indonesian and if you make the trip to Kiluan you can even go dolphin spotting and enjoy the graceful creatures that swim in the waters here. Lampung is also the home of the Bukit Barisan Selatan National Park which offers you some great hiking trails and the opportunity to see a range of local flora and fauna. The rainforests of Sumatra have been declared a UNESCO World Heritage Site, so the chance to enjoy the natural scenery is one of the highlights of a trip to this part of Indonesia.